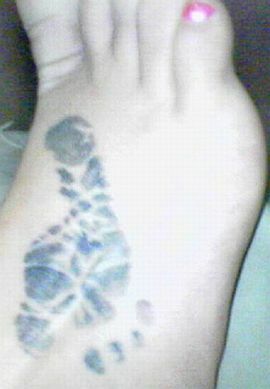 The tattoo shows the footprints of a baby on mother’s foot. This is love of a mom towards her child, which is shown in form of a tattoo. The tattoo shows the footprint from her birth certificate. Mothers never want to forget their children when they start to walk and this woman has taken the footprint on her foot in order to remember that their daughter has ever been so small that she needed her to walk.